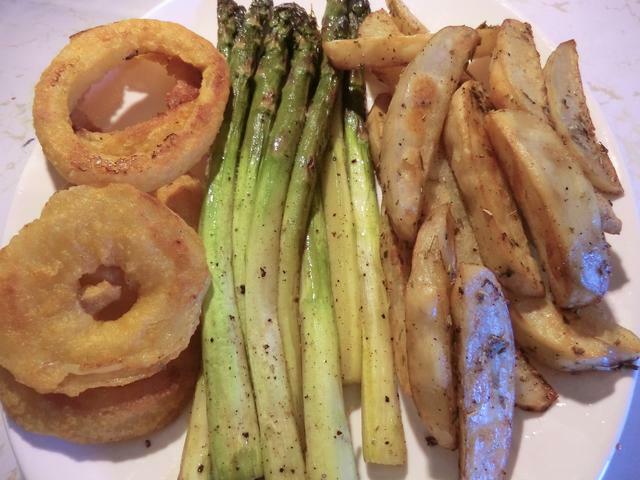 June | 2017 | Cooking is Fun … Really!! There’s a lot of overlap between Romanian and Hungarian dishes, which we learned when my brother married a Hungarian girl. 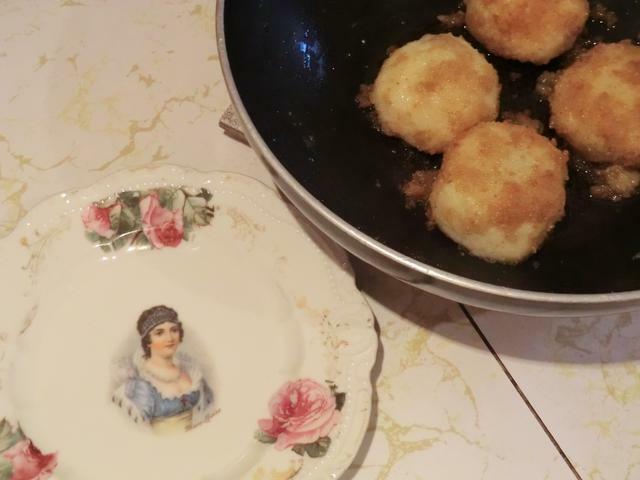 Like these these potato dough dumplings that may be filled with sour/sweet plums or cherries. I had a pound of sweet cherries in the freezer so that’s what I went with. 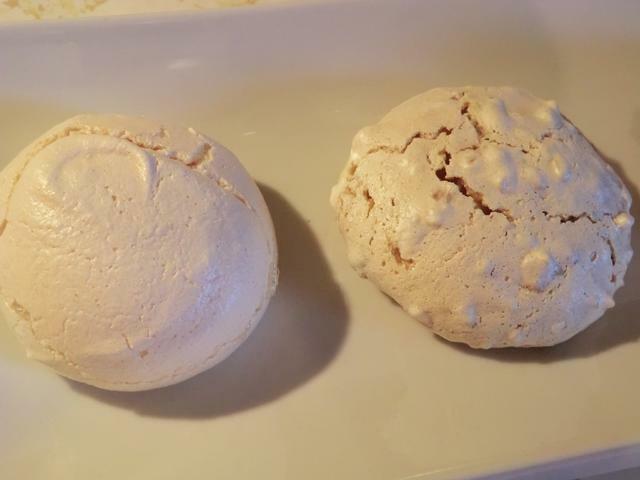 I used the ingredients and technique I found in a recipe online but reduced the amount of butter used and rewrote the instructions. Scrub potatoes and bring to the boil in a large pot of salted water. 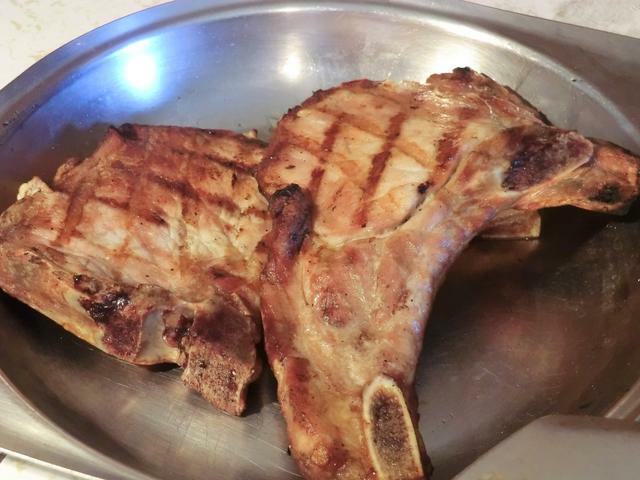 Reduce heat to low and cook covered for 1 hour or until tender. A steak knife inserted into the potatoes should go in easily. Drain the potatoes and cool slightly, then, peel. For the best texture, pass the cooked potatoes through a potato ricer into a large mixing bowl. Otherwise, just use a potato masher. 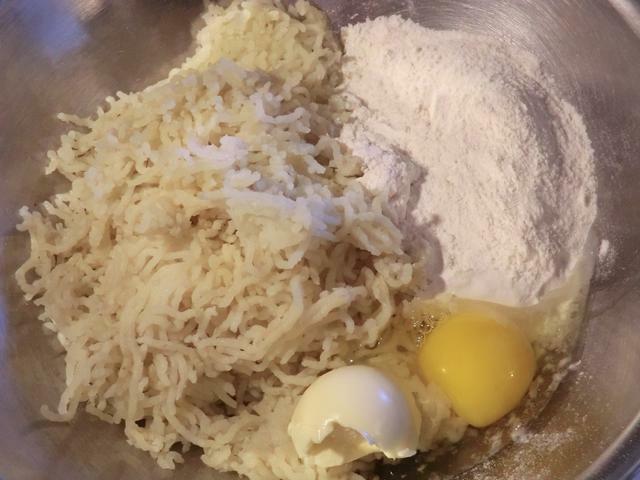 Add 2 cups of the flour, the softened butter, salt and the beaten egg to the bowl and, with a fork or your hand, combine into a smooth mixture. 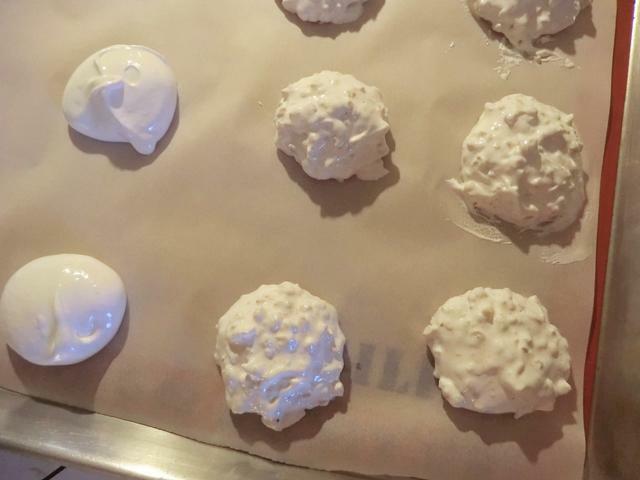 Turn out onto a floured working surface and gently knead just until you get a soft dough, adding flour as needed. 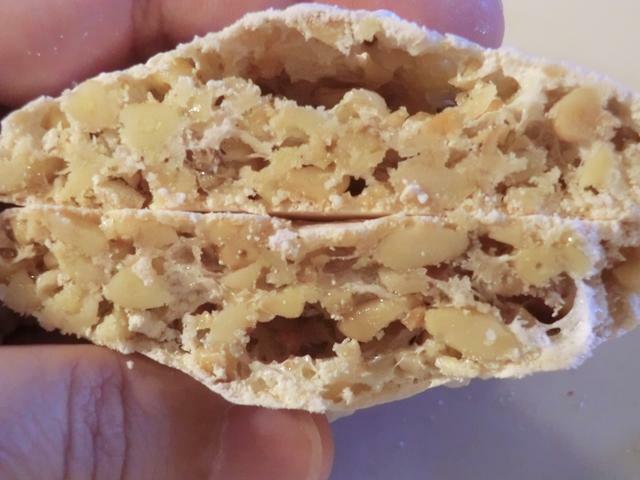 Don’t overwork/handle the dough or it will become tough. 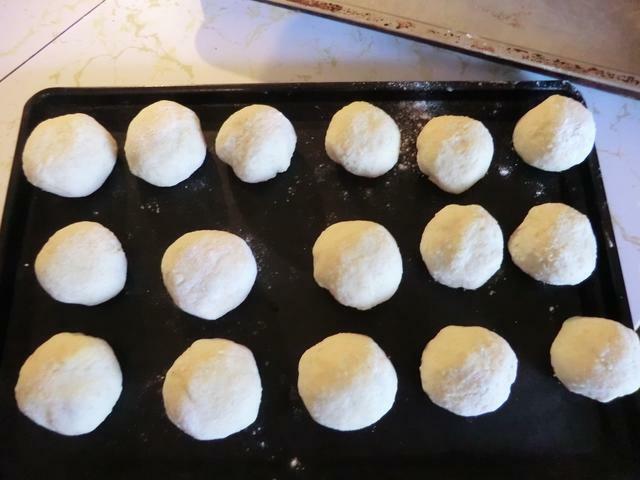 Divide the dough in half and then each half into 15 or 16 portions to get 30-32 balls. Working in batches of 5 or 6, drop the dumplings into a pot of boiling salted water and cook for 6 minutes or until they rise to the surface. Remove and place onto a large tray while making the sauce. 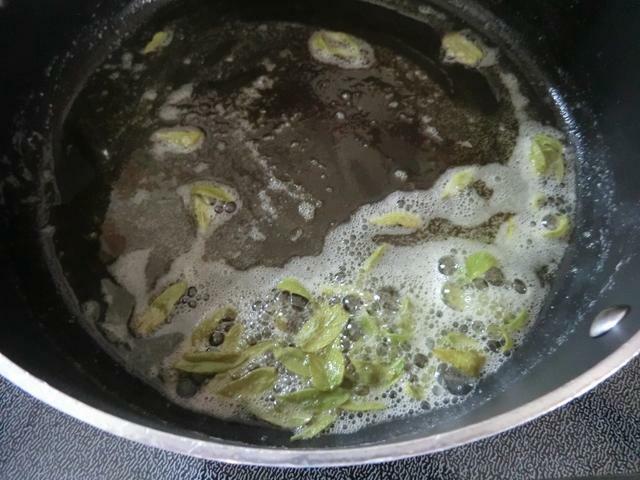 Melt the butter in a large frying or saute pan over high heat. Add the breadcrumbs and cook for a couple of minutes or until light golden. Add the dumplings, shaking the pan, for 2 minutes or until well coated. 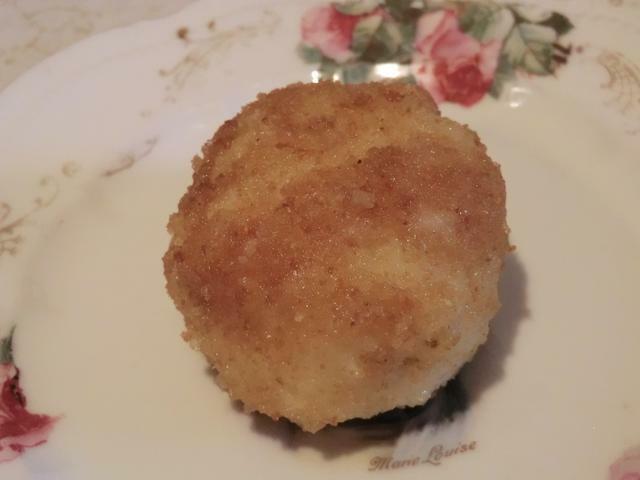 Combine the cinnamon and sugar, spoon over the dumplings in the pan and shake again to distribute over the dumplings. 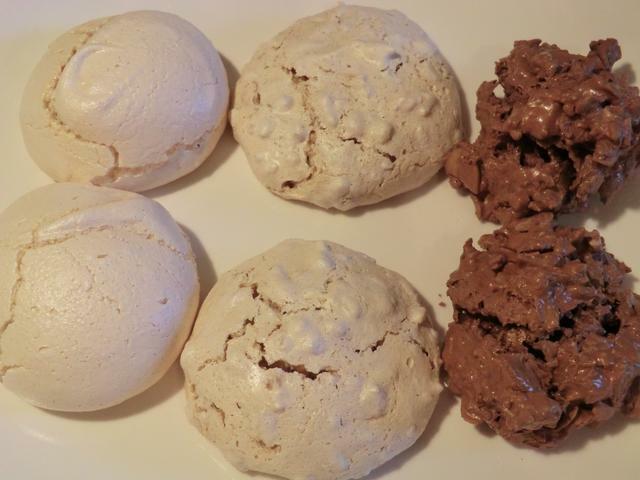 Serve 2 to 3 dumplings per person and dust with icing sugar. 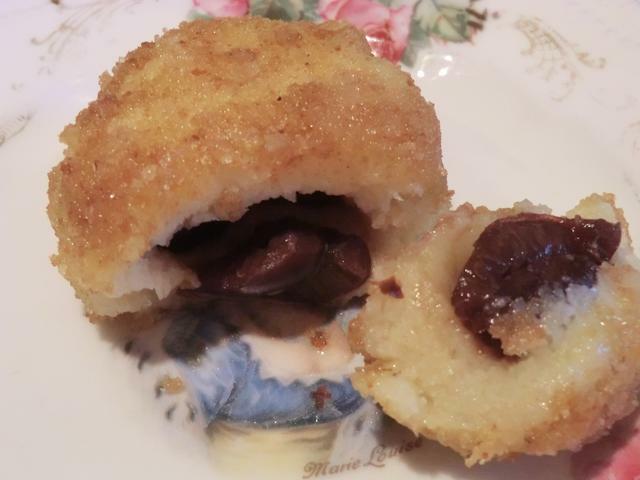 NOTE: For the plum version, use one small pitted plum per dumpling. If the plums are large, cut them in half. My friends, I’m about to reveal something to you that you may not have known about me. No, I haven’t buried anyone in my back yard. For years, I turned my nose up at using canned beans in my chili or soups. Cause my mom always used to buy dry beans, cook them up, and then use them in her recipes. A shortage of funds as an immigrant to Canada may have had to do something with it. Or maybe just having grown up in Europe between the two world wars when the luxury of buying canned vegetables wasn’t available to subsistence farmers in Yugoslavia. 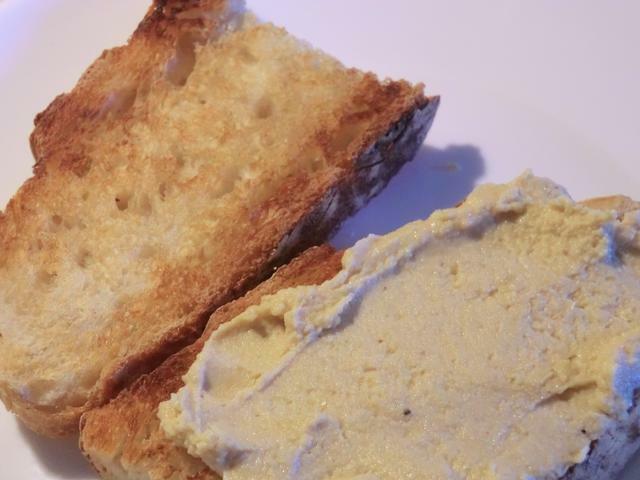 Many years, ago, I discovered hummus and decided to make it at home. From dried chickpeas/garbanzo beans. 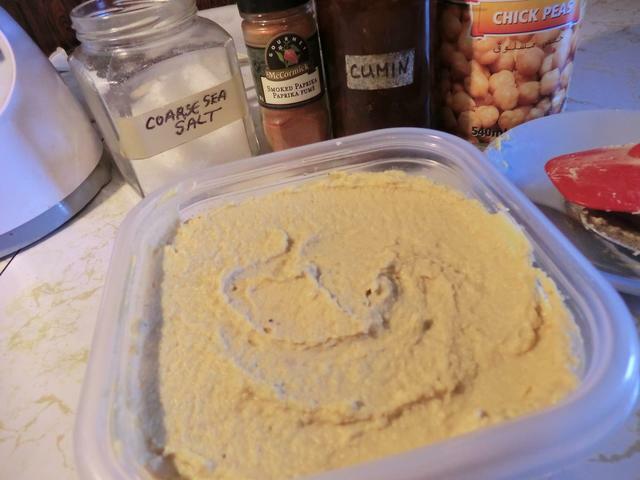 But no matter how long I cooked the chickpeas … no matter what recipe I used, I ended up with something other than that smooth luscious spread I got in Middle Eastern restaurants. It TASTED delicious, but the texture was disappointing. I blamed my inexpensive blender. 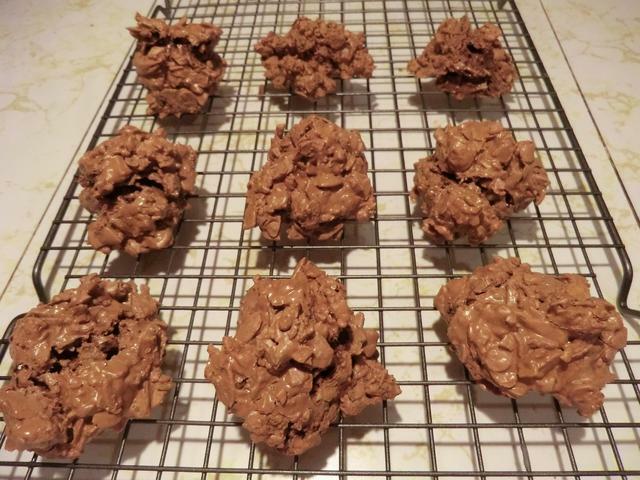 I switched to a food processor. Nothing. Until I bought a 79 cent can of chickpeas on sale. I will never have to buy hummus again. 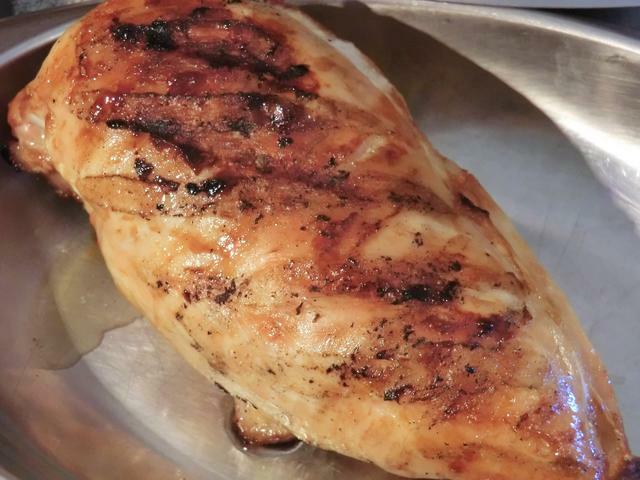 I’ve re-posted the recipe I used below with the information needed to make a roasted red pepper version. 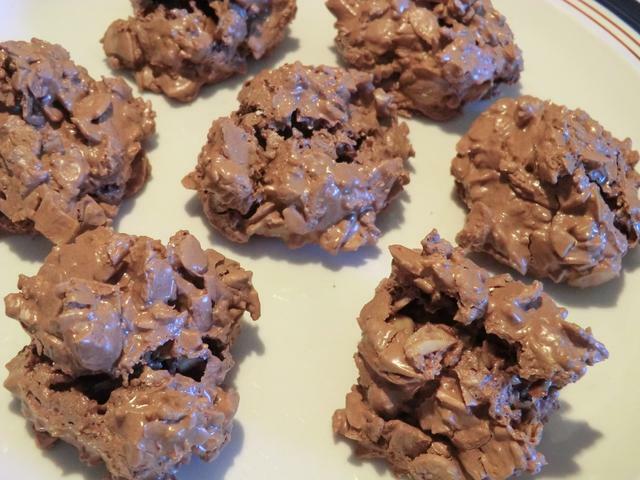 ETA: Click on the middle eastern ‘tag’ for some other amazing recipes. Roasted red pepper variation: Halve a red pepper, remove the seeds, brush with a bit of oil on skin and then broil, skin side up on a foil lined baking sheet, for 10-15 min or until the skin starts to blister and char. Put into a bowl covered with saran wrap and let sweat enough to loosen the skin. Peel off the skin. 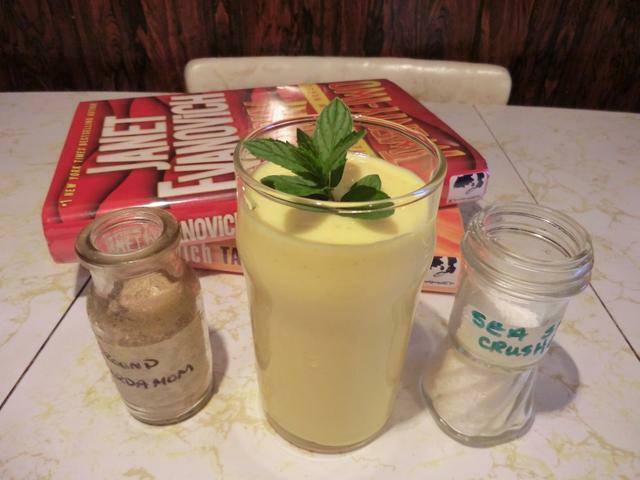 Add tahini, lemon juice and water to a food processor (or blender). Process on high speed until it becomes very light-colored and fluffy, which shouldn’t take long. Add the roasted red pepper and garlic and process again until incorporated. Add the chickpeas and olive oil, about 1/3 at a time, processing to incorporate them completely before adding more. Once all of the chickpeas and olive oil are added, process for a few minutes longer, stopping to scrape the sides down occasionally, until it becomes as creamy as you’d like. If it seems too thick, add a bit more water (or olive oil for a richer hummus). When it’s reached your desired consistency, stop the food processor and sprinkle in the paprika, cumin, and a pinch of salt and pepper. Process to blend them in. Taste and add more salt and pepper if you’d like, processing after each addition. Serve with crunchy vegetables, pita bread or tortilla chips, or use as a spread on sandwiches! 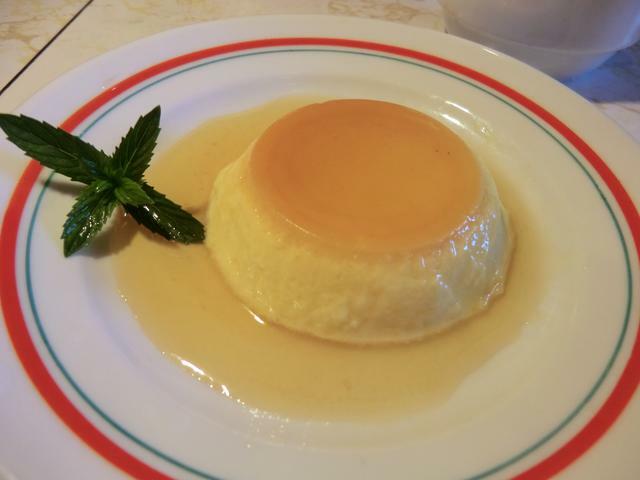 ETA: A link back to a basic flan recipe was added as it’s been years since I posted it and it’s SO easy to make. There are days when I wake up with the energy to do some cooking but no idea WHAT I should cook. It’s often hard to choose among several options with the items on hand. 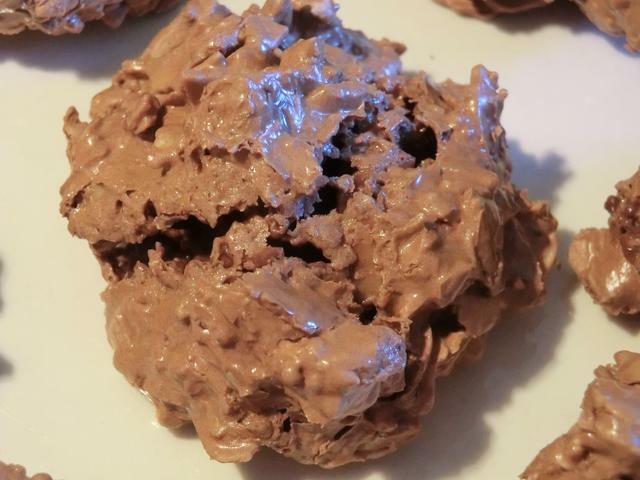 Sometimes, it takes googling to find variations of recipes when certain items aren’t available. It’s even more challenging when I have lots of leftovers in the fridge that I can re-imagine so I don’t HAVE to cook. Right now, I’ve got an entire cooked steak, flour tortillas, a couple of avocados, eggs, and salsa in the fridge and leftover refried beans and basmati rice in the freezer. I think breakfast/lunch/dinner may be something Tex-Mex inspired. 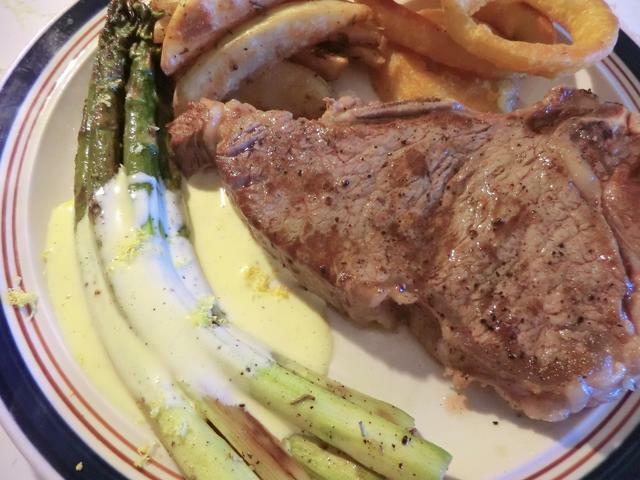 On the other hand, I also have leftover hollandaise sauce, roasted potato wedges, asparagus and onion rings in the fridge. And frozen English muffins. And then there’s the container of white bean, pasta and sausage soup that I made a couple of days ago (the rest are in the freezer) that I should be eating. Here’s what some of the leftovers are from. That’s some of the hollandaise in the little ramekin. And that was the last of three little vanilla flan I made with the two yolks from making the ‘brutti ma buoni’. PS: It’s chilly in the house so turning the oven on to cook is a GOOD thing. After a warmish week which culminated in a HOT Thursday, I woke up to rain and a much cooler Friday. School/work is done as the last class was yesterday and the chance of getting a call during exam week is slim. Just got my VISA bill, and though expected, the hit is a bit of an ouchy due to the plumbing bill. At least now I can use the upstairs tub after a good snaking out and the downstairs tub won’t be dripping hot water … and money. It’s the last of the big bills (knock wood) til I get my 2nd set of city taxes. Still, it means I have to be very frugal until October when I would be getting my first paycheque of the new school year. I need to go to the library and pick up a book that I’ve got on hold, but other than that, I have no reason to go out. So, I guess I’ll do some cooking or rather, baking. Speaking of … I’ve been scavenging through the fridge and freezer again for meals or components to go with recent purchases. 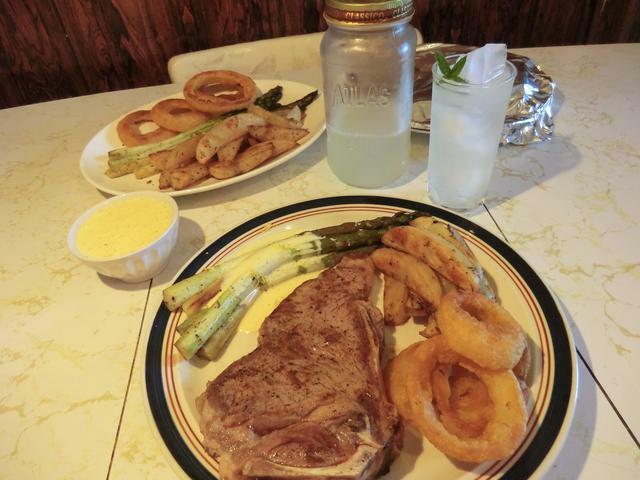 A bit under two pounds of fresh asparagus for $3.50. Enough for four servings with minimal wastage. 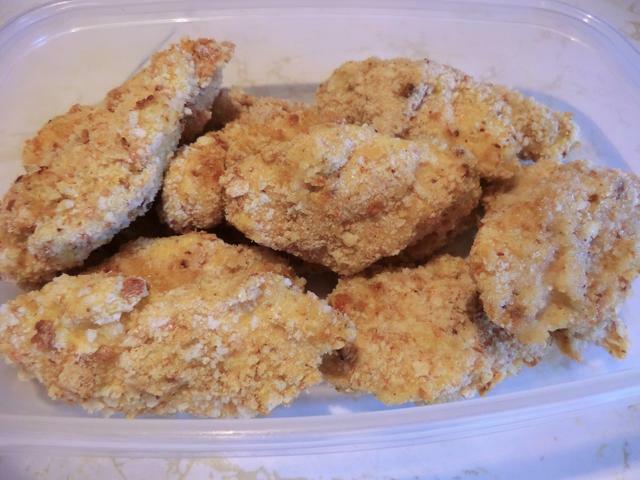 A tray of five boneless and skinless chicken breasts, picked up for 40% off, means I ended up with five top cutlets. 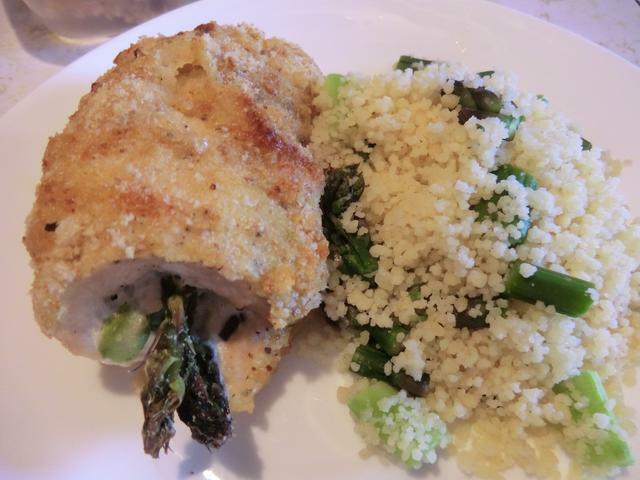 One of the cutlets became an asparagus roll-up which was crumbed and baked, along with fifteen chicken tenders from the bottom of the breasts, for supper. The other four cutlets and ten of those tenders went into the freezer. Pretty good for $10. The KFC flyer has a bucket of 8 chicken tenders (ok, they’re bigger pieces) for $10. I laughed. PS: The bread crumbs used for the cutlet and tenders were made with my own sourdough bread. 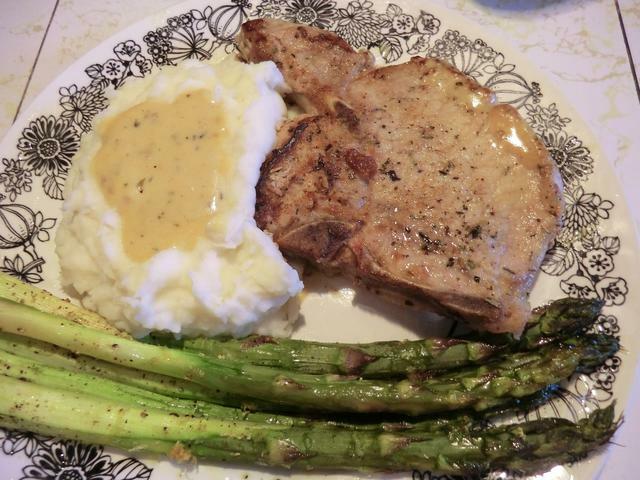 The combo pack of six pork chops for under $10 gave me two great comfort meals of pan fried pork chops, baked asparagus, mashed potatoes and pan gravy and there are four more chops for the freezer. 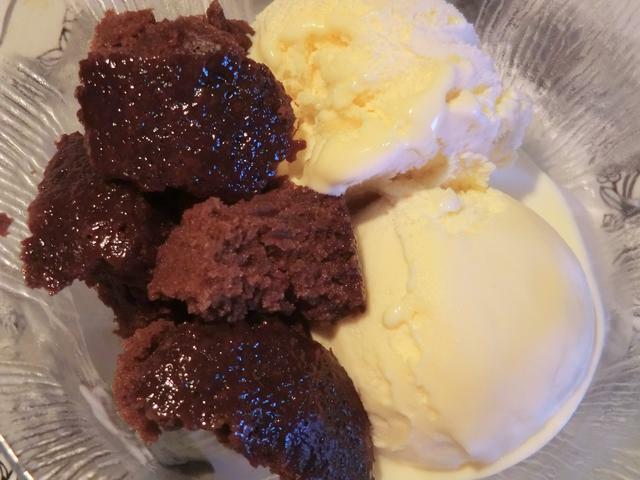 With a couple of scoops of vanilla ice cream, my fudgy chocolate cupcakes made for a great fast dessert. 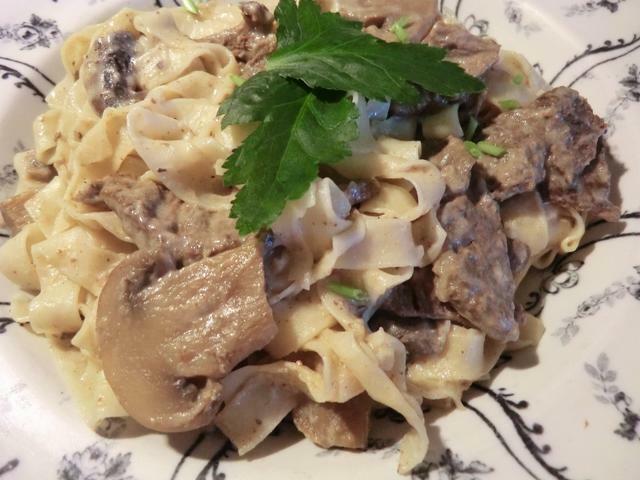 The scraps of pasta from my ravioli became tagliatelle and were combined with beef stroganoff from the freezer. Enough for three meals. I’m glad I didn’t throw away those scraps. And, a beautiful fresh mango became a mango lassi when combined with milk, sugar and some yogurt. 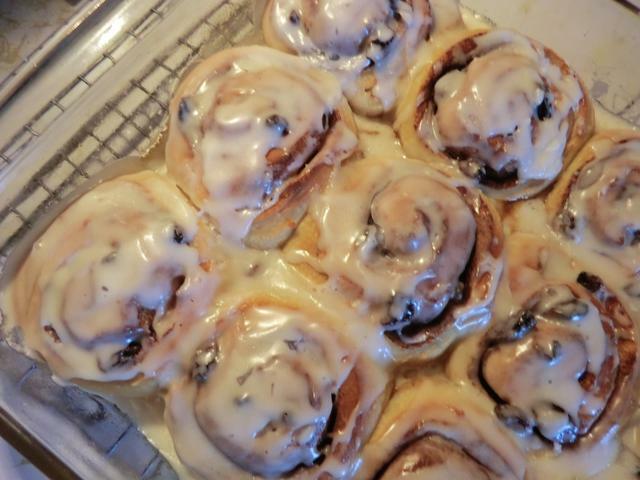 I HAVE baked … a tray of hybrid sourdough cinnamon rolls, most of which are looking for a good home. It’s been a productive week in spite of not working at all. Sometimes you run across the most interestingly named dishes while browsing through cookbooks or surfing the internet. 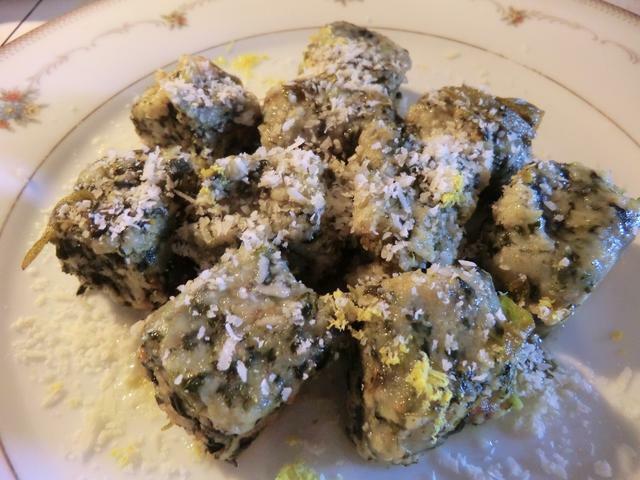 Malfatti, or “poorly made”, refer to a type of rolled spinach and cheese dumpling, and like the cookies brutti ma buoni or “ugly but good”, also from the Italian, the result is much tastier than the name would suggest. Although they’re commonly served with a browned butter and fresh sage sauce, I’ve also found a version served with a marinara sauce and one with halved and sauteed grape tomatoes. 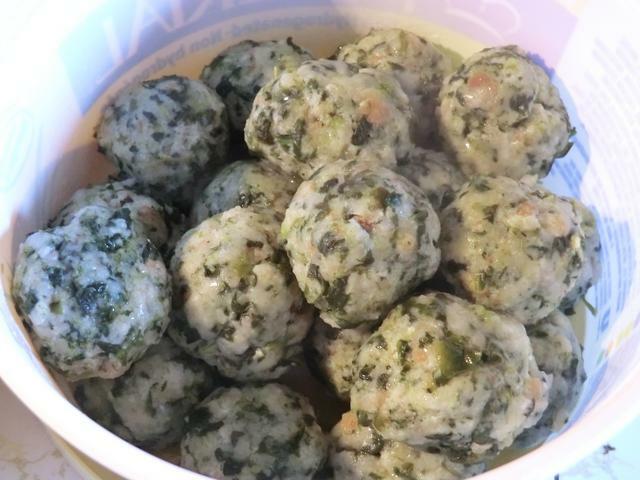 The dish is tasty but also an example of frugality … stretching a bit of cheese, spinach from the garden, and leftover bread in the form of bread crumbs, into a tasty and filling meatless dish. 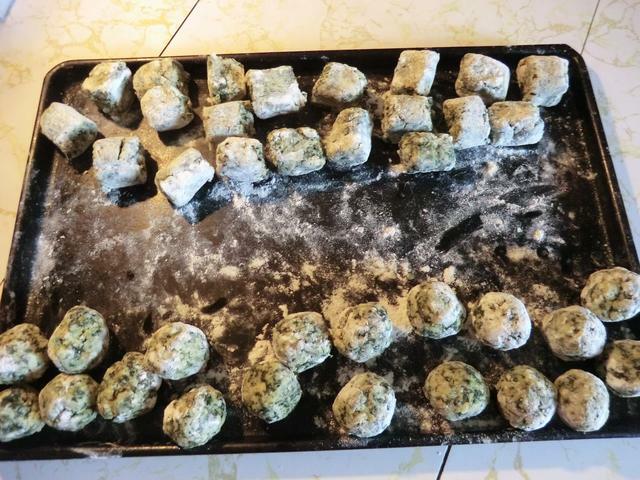 Spinach Malfatti – I forgot to add the lemon zest to the dumpling mixture so I sprinkled it over the cooked dumplings instead. It was still tasty. 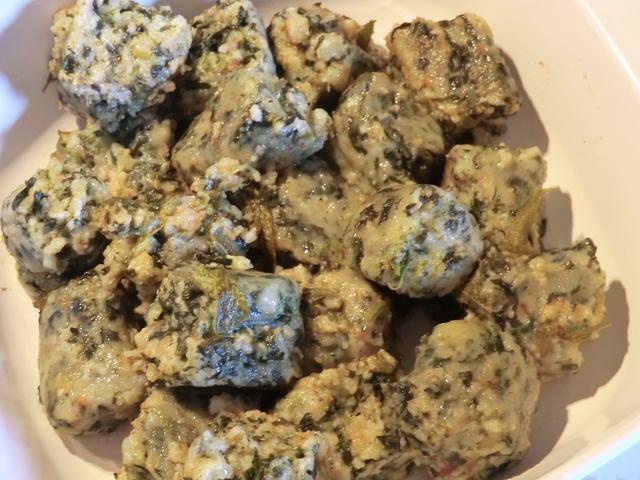 Combine the spinach with ricotta, breadcrumbs, grated nutmeg, lemon zest, grated Grana Padano cheese, and eggs. 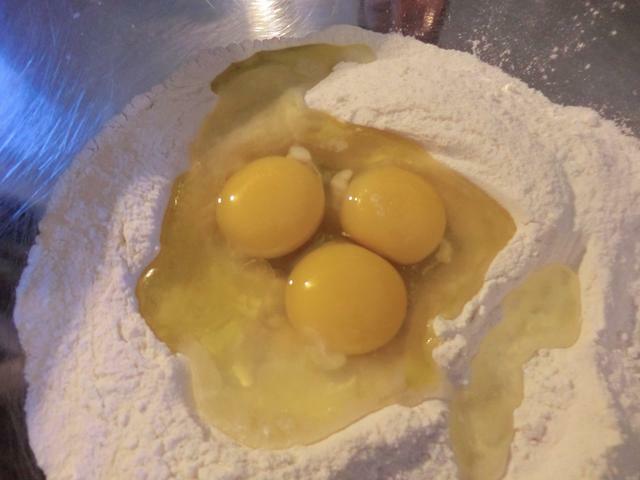 Flour your work surface, and divide the dough into 4 pieces. Roll each piece into a log, about an inch thick. Cut each log into dumplings about an inch wide. 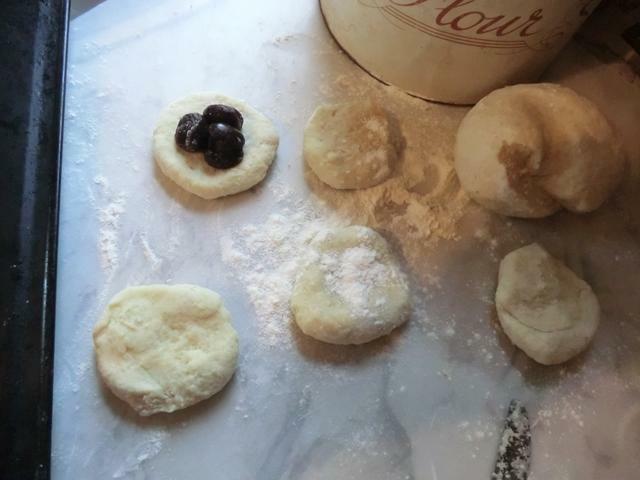 Toss the dumplings with a bit of flour if you’re not going to cook them right away. 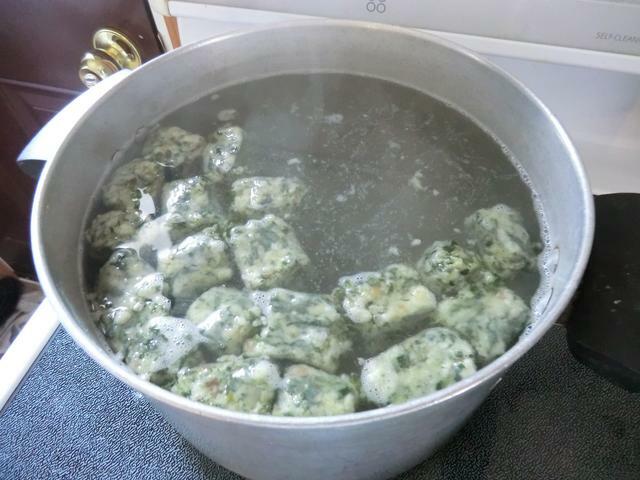 Bring a large pot of salted water to a gentle boil then add the dumplings and cook until they float to the top, about 3 to 4 minutes. Before you drain them, reserve 1/4 cup of the cooking water. Melt the butter in a saute pan over medium heat. Add fresh sage, and cook until the butter just begins to brown. 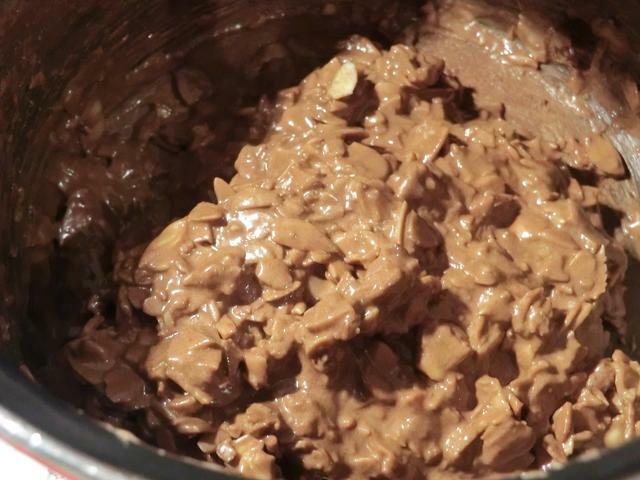 Then whisk in about 1/4 cup of the pasta cooking water, gradually, so it emulsifies with the butter. 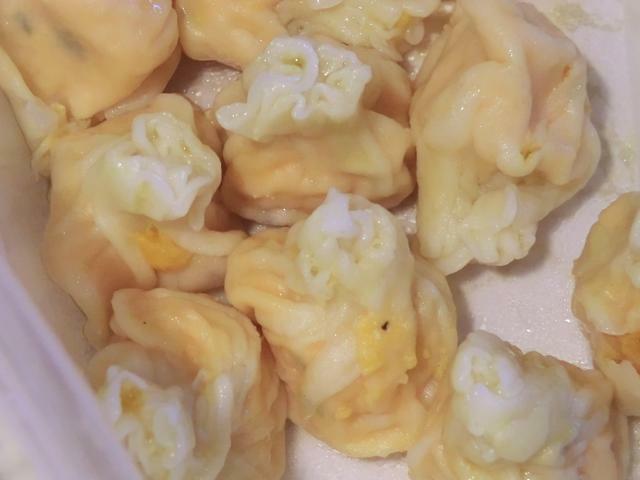 Add your drained dumplings to the butter and shake the pan gently to coat. 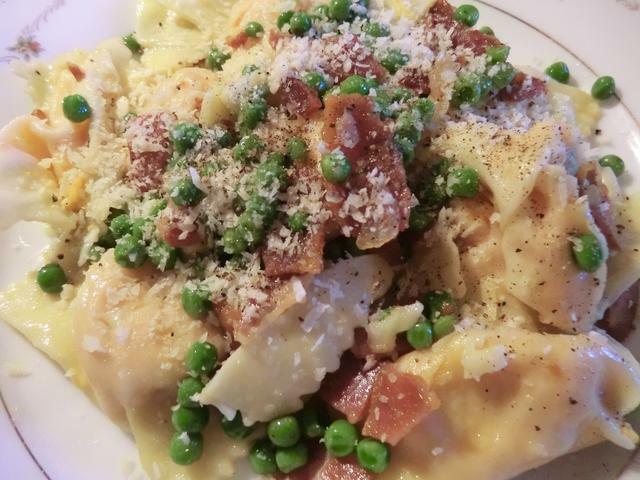 Just before you serve the dumplings, squeeze some lemon juice over them and grate a little more grana padano cheese over the top. I’ve barbecued for at least three weekends in the last month because, miracle of miracles, it’s NOT raining. And I like the taste of bbq’d meats. 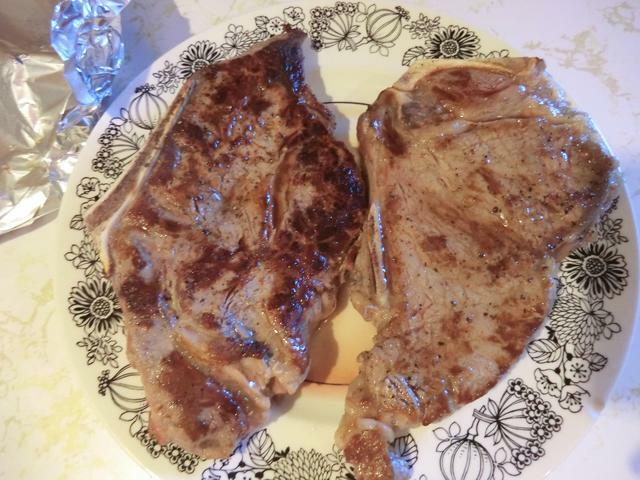 I was going to throw sirloin steaks, burgers and a chicken breast on the grill but switched out the last two pork chops in my freezer for the steaks, so I wouldn’t have two beef items. 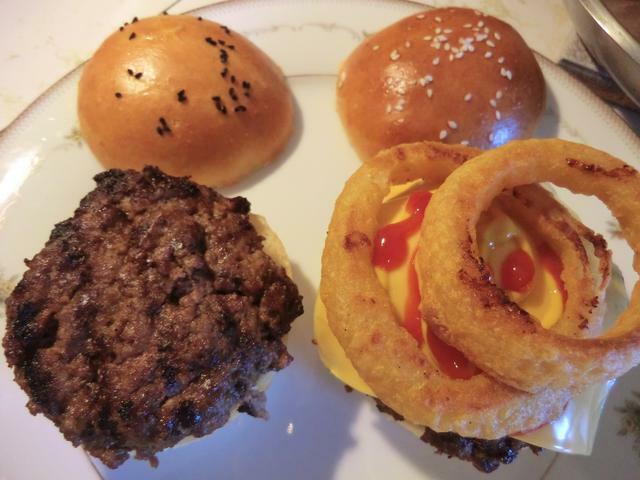 In anticipation of the burgers, I decided to make my own hamburger buns. 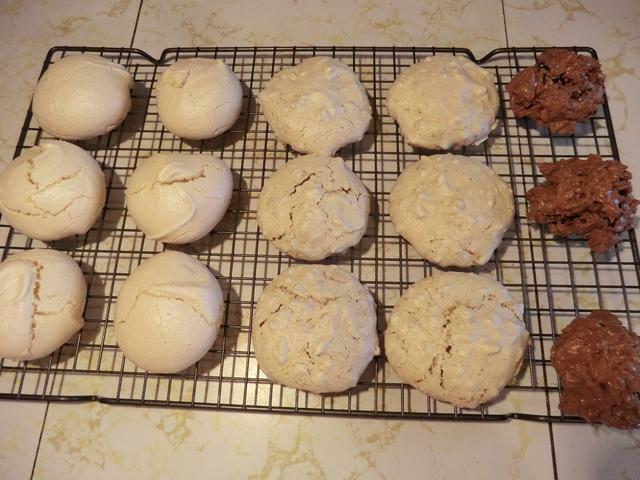 My recipe makes enough dough for sixteen buns but I made hoagies with half, so I ended up with eight buns and four hoagies. Brioche breads freeze and thaw wonderfully, so that’s why I decided on an enriched rather than a lean bread recipe. It tastes good too. 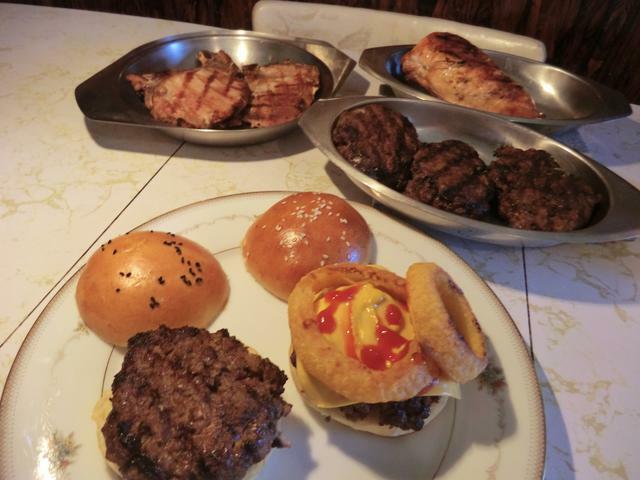 Hamburgers … naked and dressed – I don’t like raw onions on my burgers but onion rings. Oh mama!! The rest of the barbecue – Now I just have to figure out what to serve for sides in the week ahead … although I’m thinking of sticking that chicken into one of the hoagies. I haven’t made ravioli from scratch in a while but after picking up a pound of ricotta cheese from the local Italian grocery store and with a medium sized sweet potato sitting on the counter in the kitchen, I had my inspiration. 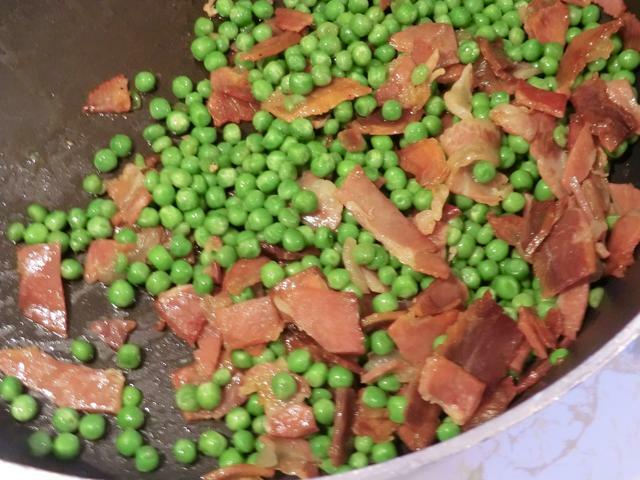 An economy ($2.31 for ~3.5 oz) package of prosciutto ends and a cup of frozen peas made for a tasty sauce. Word to the wise … don’t start rolling out pasta late in the day when your kitchen is hot and you’re cranky and tired. Cause you end up rolling the pasta too thin, and then forget to cover it so it dries out. 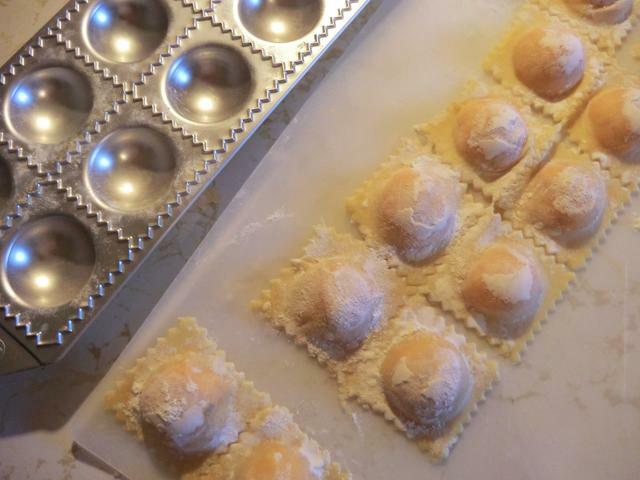 And trying to turn your thin drying pasta into sacchettini (little purses) when the tortellini shaping isn’t working out. Well, it’s not pretty. I ended up with some misshapen sacchettini and free-form square ravioli which I froze for bagging. Then I dropped the package. Cooked them anyway and covered them with the sauce and grated cheese and ate them in protest. Broken free-form ravioli covered with sauce and grated Parmigiano-Reggiano – It was delicious. 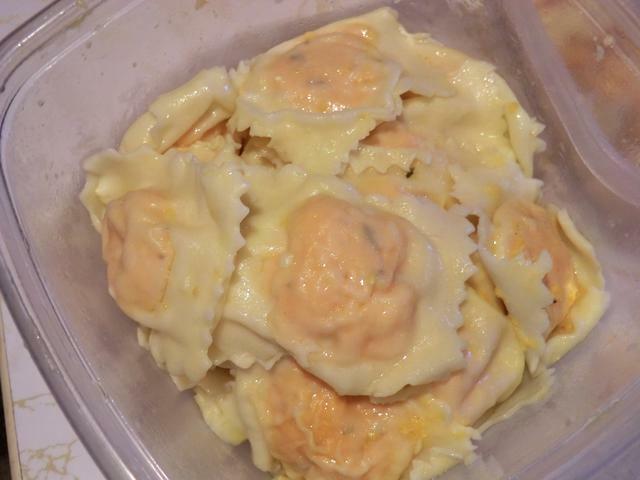 I made a couple dozen ravioli in my molds with the last of the filling, boiled them up, as well as the sacchettini, tossed them with the sauce and then froze them away for work lunch and two future meals. Filling – 1 cup cooled mashed sweet potato, 1/2 cup ricotta cheese, 1/2 cup grated Parmigiano-Reggiano cheese, 1 tsp dry minced onion, 1 large egg, 1/4 tsp dried thyme, pinch or two dried garlic powder, salt (1/4 tsp) and ground black pepper (1/8 tsp) to taste. Enough for about 4 dozen ravioli at 1 tsp filling for each. 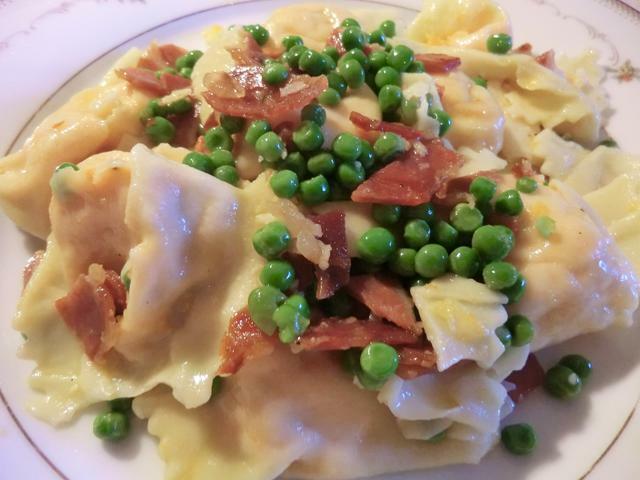 Prosciutto and pea sauce combined with the broken ravioli … pretty all on its own. I have the trimmings of the pasta in the fridge and may make plain noodles later today. Or maybe not. PS: Ended up with 200 gm of tagliatelle noodles. 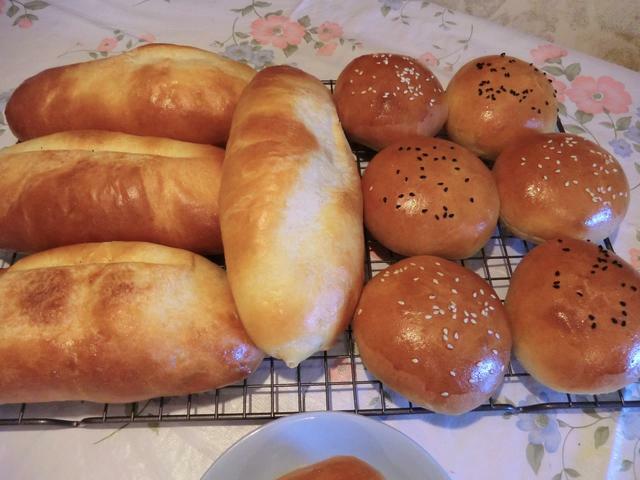 I made some duck fat brioche dough and turned it into hamburger buns and hoagies earlier that morning for a planned bbq the next day. Watch for pictures. 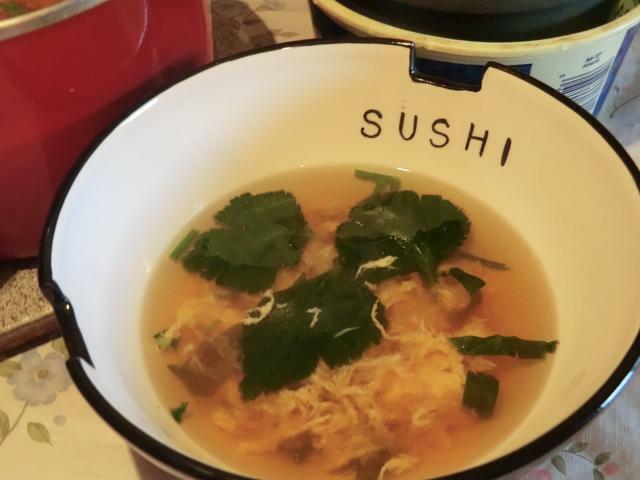 Miso soup is my ‘go to’ quick soup when I want a light, clean tasting soup with a flavourful broth. 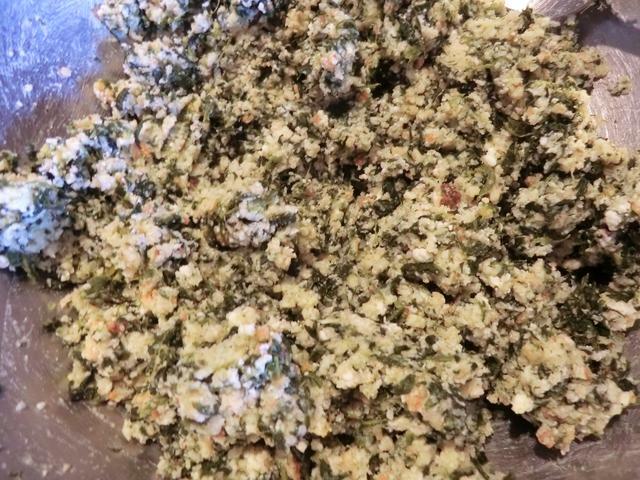 Although I COULD make a dashi stock with a sheet of kombu (dried salted seaweed) and katsuobushi (thinly shaved bonito flakes), I use hon-dashi powder for the convenience. MSG is a component so if that’s an issue, you may want to avoid it. I usually have white and red miso paste in my freezer and the kind I use depends on what I’m in the mood for. Or what’s left over in this case. 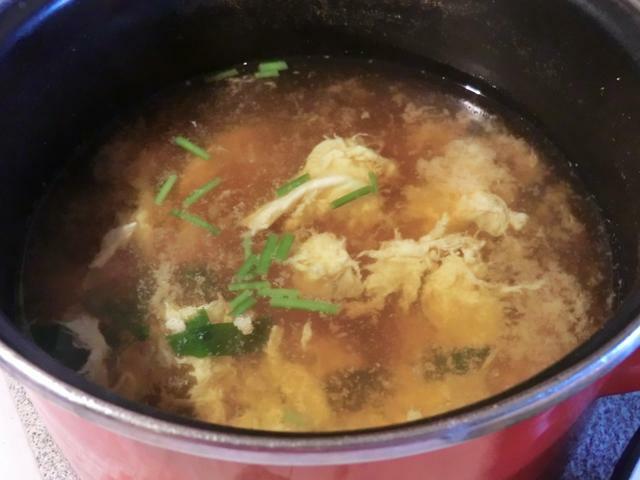 Some medium firm tofu and a beaten egg drizzled into the simmering broth gives my miso soup substance. As does some soaked and thinly sliced wakame (edible seaweed also called ‘sea mustard’). For a fresh element, I snipped in a few stalks of mitsuba (wild Japanese parsley) from a pot that’s been overwintering surprisingly well on the front windowsill. With the sunlight streaming in, my little plant is producing fresh whorls of new leaves regularly, in spite of the less than proper care that it’s been getting. Watering it regularly is about all I do. 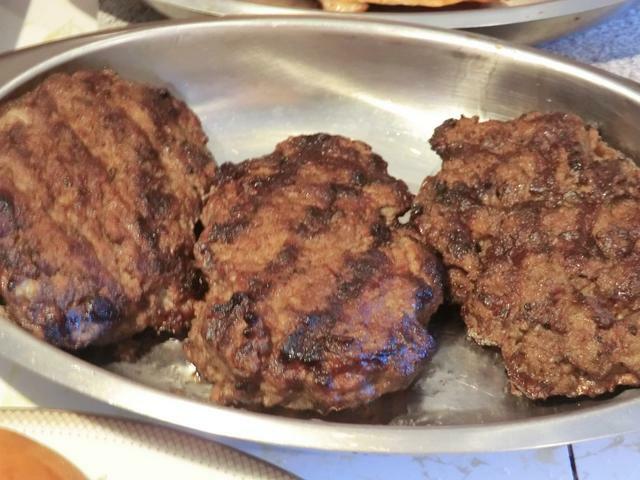 Regular parsley, green onion, or even fresh spinach are other options. Instead of salt, I added a few dashes (close to a teaspoon to 5 cups of water, to be honest) of Chinese soy sauce and a few shakes of ground pepper. It takes longer to write this than it does to bring the water to a boil and make this soup. A bigger challenge is taking a good picture of miso soup. If you stir it up, it looks cloudy, while if you let all your ingredients settle, it just looks like water with a bunch of stuff on the bottom. I just wish I had a nice Japanese/Chinese spoon for the aesthetics of the picture but I’m too cheap to spend $2-3 on a single spoon. Oh well, my big sushi bowl will have to do. Mitsuba – Trim your stalks close to the soil and use the entire stalk in your soup. Even the roots are edible especially if grown hydroponically. 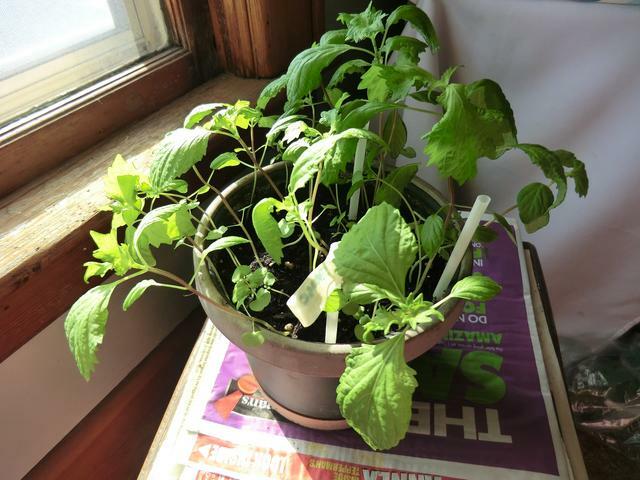 Shiso – It’s hard to tell which was the plant which self seeded as several of its late siblings have really shot up after I scattered the seeds from the dried out twig over the soil and watered it. 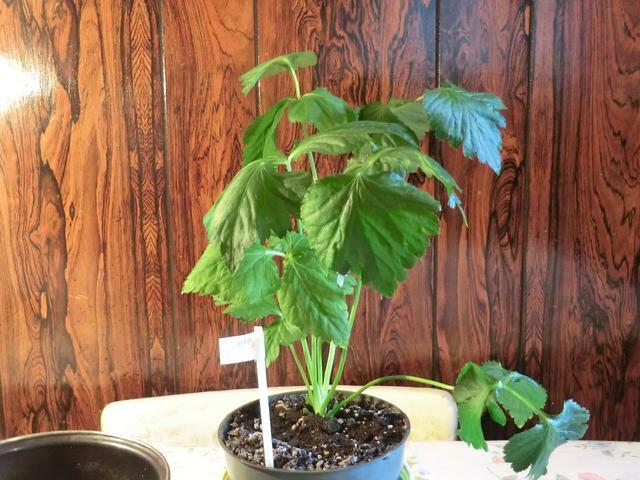 I really need to thin and separate these plants but I don’t want or need that many shiso plants and I hate to throw them away after their surprising survival. 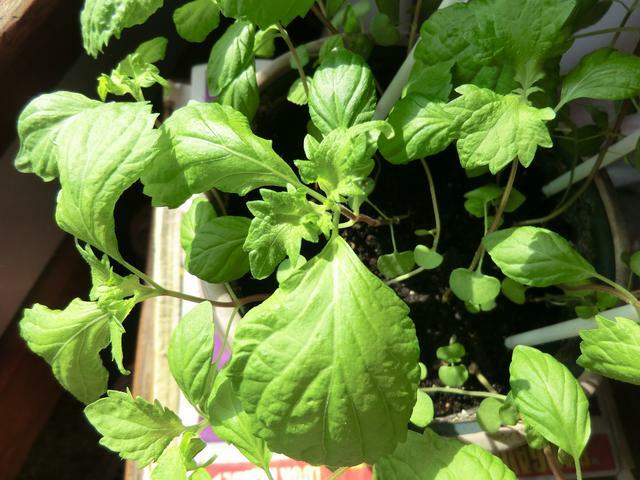 Close-up of the shiso leaves – Unfortunately, my single red shiso plant didn’t flower so I lost it. 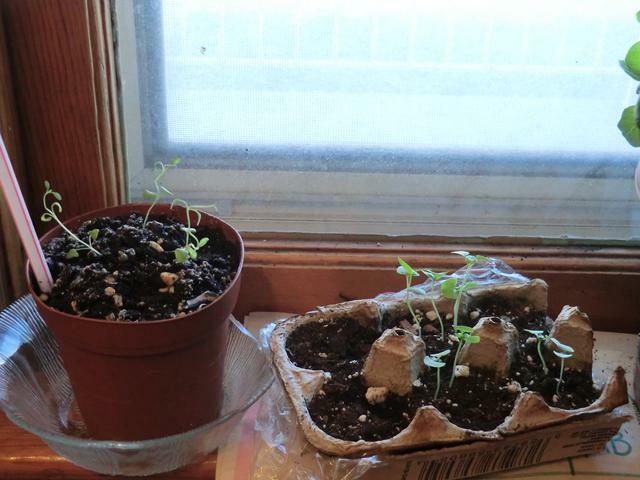 Lavender and basil (Mammoth Italian and Thai) – The three lavender seedlings in the pot on the left seem pretty scraggly but they’re the only successes from a planting of about a dozen seeds. I planted the four outer egg carton cups with the Italian basil but only one had any growth, two measly plants. The two center cups have a total of six Thai basil seedlings ready for transplanting. 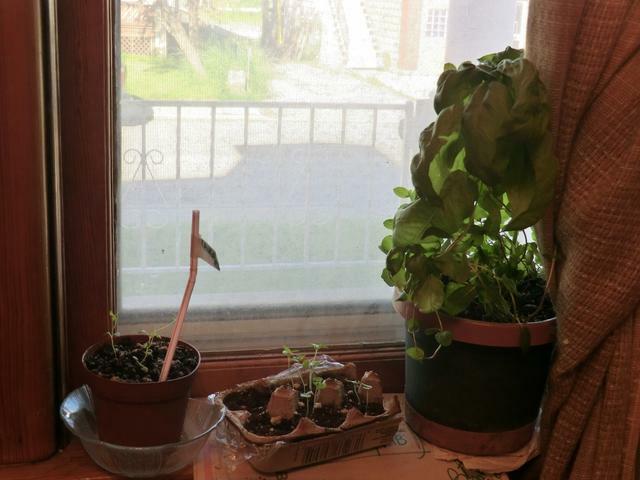 Mammoth Italian basil and some oregano that overwintered pretty well on the window sill.